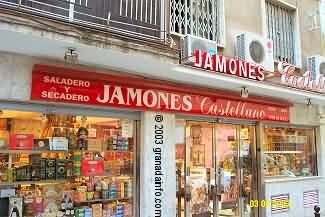 A Spanish delicatessen with an excellent selection of hams, cheese and local delicacies. This shop has existed for donkey's years and is very well known throughout Granada. There is also a selection of foreign things that may be hard to find in Granada such as: maple syrup, indian pickles etc. See location on map: in a small street off the Gran Vía de Colón opposite the Cathedral. This page was made without the knowledge of the owners of the shop. of grandainfo.com and not of the shop itself.